Roger Christian began his early years in hockey like most other youngsters in Warroad, playing road hockey four to five hours or more on the river and on outdoor rinks. He and his brother, (fellow enshrinee) Billy, used magazines for shin pads and hockey sticks made by their father. They even shared a pair of skates and one would use them for half an hour then the other would trade. Roger started playing high school hockey for Warroad in 1950, and by 1952 he was the team’s leading scorer. In 1952 he led Warroad to the State Tournament, something sacred to all kids in the Land of 10,000 Lakes. Over his storied prep career he was selected to the All-State Team, and was named All Region twice. He would go on to star internationally after that. In 1958, he led the U.S. National team in scoring, under Coach Cal Marvin and Manager Don Clark, and in 1960, Roger played on the fabled Gold Medal winning Olympic Team, alongside his brother. He would go on to play on five U.S. National teams altogether. After that, Roger went on to play for nearly 20 years with his hometown Warroad Lakers, an amateur dynasty, where his No. 7 Jersey was later retired from the Laker’s roster in 1974. Roger later co-founded the multi-million dollar stick and equipment manufacturing company called Christian Brothers Inc. In addition, he remained active in local community and youth hockey programs as well. Robert Paradise began his interest in athletics, and hockey in particular, at the age of ten. He attended Cretin High School, where he starred in hockey, baseball, and football. From there, he moved on to St. Mary’s College in Winona, Minnesota where he became an all-conference performer in the Minnesota Intercollegiate Athletic Conference for four consecutive years, (first as a center and then as a defenseman). 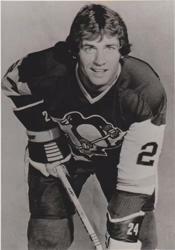 It was at defense that the aggressive Paradise caught the eye of NHL scout and former Boston Bruins star, Fern Flaman. He passed up an opportunity to sign a Boston Red Sox contract in 1965 in order to complete his education. After graduation from St. Mary’s in 1966, Paradise joined the 1968 United States Olympic Team and later the 1969 National Team before turning professional with the Montreal Canadiens organization. After two years in the minors and a brief stint with the Minnesota North Stars, he was drafted by the Atlanta Flames in 1972 and then went on to a six plus years career with the Flames, Pittsburgh and Washington. 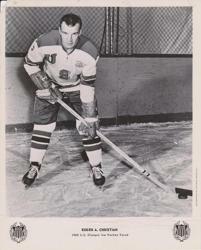 Paradise was a defensive-minded defenseman and at 6-1 and 205 pounds, was noted for his physical style of play. He received a Sports Illustrated recognition in 1976 when he checked Clarke Gilles, the New York Islanders tough-guy, in the play-off game between the Islanders and the Penguins. Robert Paradise is the son-in-law of the Hall of Famer, Bob Dill.